Malla means hand. 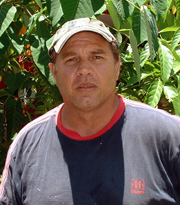 I was born in Cairns and my tribal ancestry, Ku Ku Yalang, originated from the Daintree area of Far North Queensland. During my career as an artist I have had exhibitions in Cairns, Brisbane, Sydney and Melbourne. I am very dedicated to my work and determination to be the best artist I can be and am now recognised as a leading Aboriginal artist. The art itself is our traditional written language.